Well, this post is slightly over-due. Here it is January 7 - and I'm just now posting about Christmas! But, it still looks like Christmas outside! We are being slammed by a heavy snow and I won't be going anywhere. We've been fortunate to miss the heavy Winter storms so many others were hammered with. I guess it's our turn now. I just thankful I don't have to get out in it. Christmas was wonderful this year. It seemed to be extremely busy leading up to it, though. Of course, there was school. 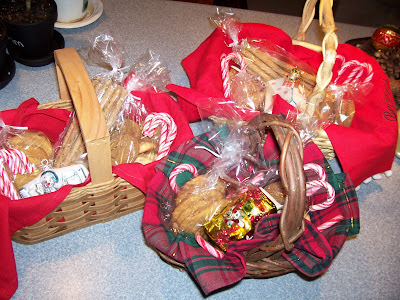 I did some baking to make gift baskets to take up to Michigan with us. Though, I didn't bake as much as last year. 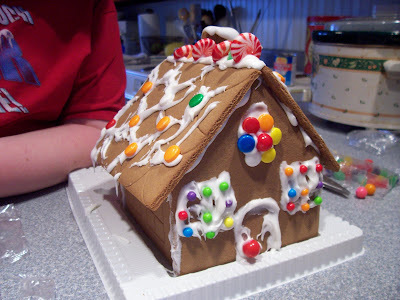 We made time to make a gingerbread house. I can honestly say, I've never done that before. But, I think we'll make it a yearly tradition. I found this kit for $6.99 at Aldi. I wouldn't have been able to buy the ingredients and make it myself for that price. 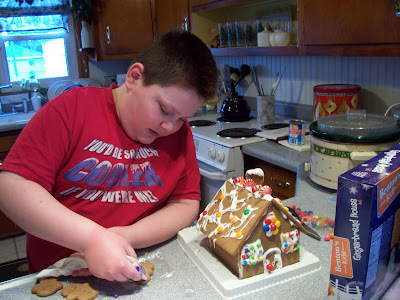 So, this was a good way to ease into gingerbread house making. 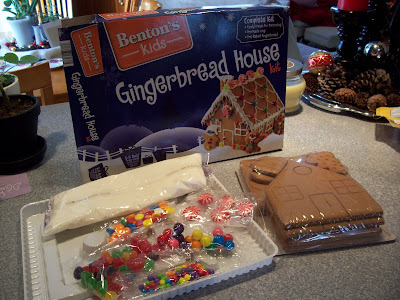 I read where one mom always buys these kits after Christmas when they go on clearance and puts them back with her Christmas stuff for the next year. Evidently, they keep very well. I thought it was a brilliant idea and wanted to do that myself. Unfortunately, all the stores that stocked them in my little area were sold out after Christmas. Isaac had a great time with this. It even had ginger people and trees. But, in typical Pam fashion - I somehow only got rear shots of the house - so you can't see them. Christmas was spent with my family in Michigan. I think it was the best Christmas we've had so far. We were able to get up there in time to actually enjoy it. Last year, we completely missed the big family gathering on Christmas Eve altogether. Chris was supposed to get off work at noon and they didn't let him out of there until 6 PM. Then our 3 1/2 - 4 hour drive somehow morphed into a 5 hour drive. Needless to say, Isaac missed the gift exchange with all of his cousins. This year we got up there the night before Christmas Eve and didn't leave until the day after Christmas. There was plenty of time to spend with family. New Year's Eve was spent with our best friends. We don't get to hang out as often as we'd like. So, that was a lot of fun. The Christmas decorations are finally down. I'm glad for that. They seemed to feel a little more like clutter to me this year than something to be enjoyed. The outside lights still need to come down. But, I told Chris he should just wait 'till it warms up slightly before doing that. He doesn't need to be out there when it's 20 degrees. As long as we're not those Christmas in July people, I don't really care. I know that suits some people just fine - I just don't happen to be one of them. We're getting back into the rhythm of school. We're in for a long stretch now - no more breaks 'till March. Hopefully, it will snow enough that we can go sledding this weekend. We've been back up here for 3 years now, and Isaac has still never gotten to go. Even when we had the big blizzard - it was melted off too much by the weekend to go. So, maybe this will be our year. He's also itching to build a snowman. I think we'll be able to do that with this snow. And when we get enough, we'll make snow ice cream. We have to. It's tradition, you know? Well, I hope you have a wonderful day! P.S. Don't forget to check out my new sister blog, Adventures in Homemaking for all things house and home!